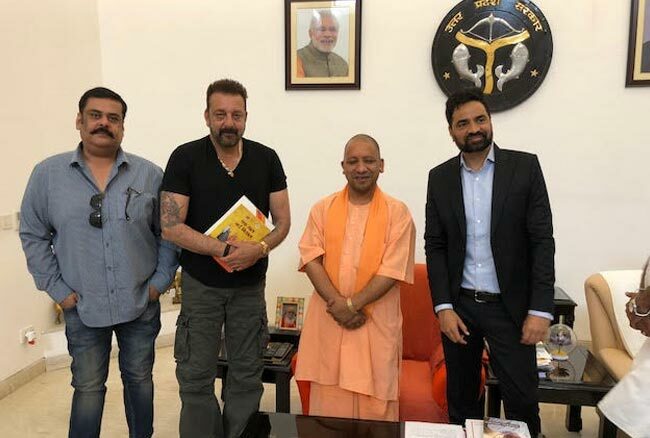 Sanjay Dutt who’s shooting for his home production Prassthanam in Lucknow called on the CM today early morning accompanied by close friend & prominent producer Rahul Mittra. Principal Secretary Awneesh Awasthi, along with other top officials from the state were also present, along with NRI Jay Patel who discussed investment opportunities in the state. Chilbila village , near Allahabad is the place where Sanju s maternal grandmother Jaddan Bibi came from and Sanju shared this with the CM and offered to adopt the village to which CM and Avneesh Awasthi immediately said yes. Apart from this filmmaker Rahul Mittra suggested a film festival in the state to further propagate art, culture & cinema in the state to which CM said bananas. The CM also urged Mittra & Sanjay to explore Bundelkhand for their upcoming films. Film institute, other social work in the state , apart from Sanju s upcoming biopic were the other areas of discussion. The meeting took place for 30 long minutes and the CM was reportedly in a great jovial mood discussing diverse issues and offering full support to the actor producer duo. Mittra was incidentally the first producer to get subsidy for his 2013 Saif Ali khan starrer Bullett Raja and was a star speaker at the recently concluded UP investors summit and is the producer of Sanjay Dutt’s upcoming Saheb Biwi aur Gangster 3 & Torbaaz.